Since 1995, American Van Lines has been offering storage and transferring services to private individuals who need to move their homes to a new city or state. The business began with two trucks, and has since expanded into a corporation that has multiple locations, headquartered out of southern Florida. Their services include residential and office moving, storing, automobile shipping, and long-distance moving to national and global locations. With over 20 years of experience, American Van Lines considers itself a trailblazer in the industry. Like many other moving companies in the United States, American Van Lines has a variety of services that are designed to offer a complete moving experience. They cater to residential, corporate, and government or military needs, and they also offer special moving services for pianos and antiques. One of their company objectives is to provide these services in a sustainable, eco-friendly way, and so they go to extra lengths to ensure that materials and vehicles used for their clients meet sustainability guidelines. Also like many other moving companies, American Van Lines relies on third-party movers to perform many of the moving services they provide. Due to this practice, every customer’s experience with American Van Lines will be different. Before last year, user reviews for American Van Lines were nearly unanimously bad, and most of the complaints focused on the fact that the contracted movers did not perform their jobs adequately. However, beginning early last year, American Van Lines’ owner began making radical changes to company policy, and many user reviews have been edited to state that, in some cases even up to four years after their service, they were now receiving satisfactory customer care to resolve lingering issues. 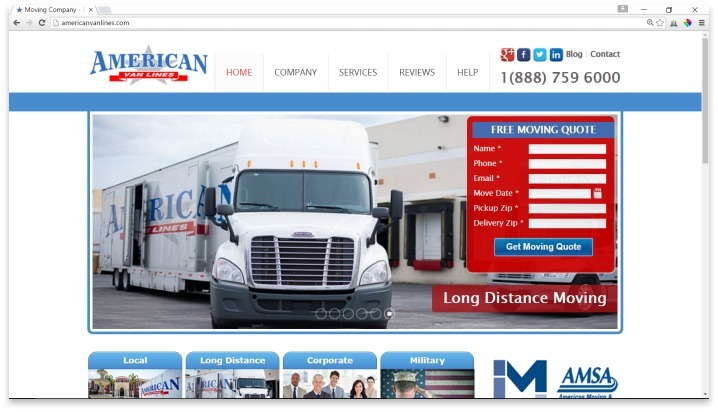 American Van Lines currently carries a B rating on BBB, and the user reviews and complaints opened within the last three years were mostly focused on the service provided by movers. Common complaints included late pickups, damaged or lost items, and an inability to contact anyone at the company during the move. While customer service reviews seem to be on the rise since the changes made last year, earlier reviews indicated a lack of contact that made moving very stressful, as well as an inability to stick to moving dates and times. In the past several months, however, the company has instituted a practice of assigning a moving coordinator to each client, so that this issue does not happen again. American Van Lines does not list their prices on their website; instead, customers must contact for a quote. Reviews indicate that prices tend to be above one thousand dollars on average, even for moves that weren’t cross-country. American Van Lines offers a variety of services that are designed to offer a complete moving experience for residential, corporate, government and military needs. When it comes to companies that have long, questionable histories that are attempting to make a change, there are two ways a contract might go: either new customers will receive stellar service, as the company attempts to improve their reputation; or customers will find that their leap of faith was a mistake, and the company will continue to offer habitually bad service. While the new focus on customer service does appear to be making American Van Lines a credible business once again, their continued reliance on third-party movers still means that they won’t control every aspect of your experience. Being such a risky choice, and considering that their prices are not the most affordable, American Van Lines just hasn’t proven yet that they are worth recommending. Have you had an experience with this company? Please share your American Van Lines reviews below. Never hire this company. They are slimy, ineffective, poorly managed, horrifically run and they only “make it right” if you agree to keep their failings private and allow them to prey on others. When you read reviews saying that AVL has “made it right”, please understand that in order for you to get any money back, you must sign away your first amendment rights by signing a boiler plate contract. Payment for silence and not writing negative reviews is how this company thinks “making it right” works. For me, buying my silence does not make it right. It would be easy to write a thesis length paper raging about the failures of this company. For the sake of succinct reporting, I have elected this format. In the interest of full disclosure regarding how horrible American Van Lines is as a moving company, the following synopsis covers the more glaring problems. Move from northern California to eastern New Mexico, appx 1350 miles. 90% of packing already done by me. Packing required for washer, dryer, refrigerator, freezer, some garage tools, large furniture items. No beds moved, no couch. 1 recliner. Requested that household goods be estimated on the high side to avoid unpleasant increase in price surprises. No tear down or setup was required of movers due to items going into storage. Company was provided a week time frame for pickup, one month in advance. 1. Quote came in significantly higher than competitors ($3K higher). When this was pointed out, the agent explained that the “other” companies were “brokers” and owned no trucks. The sales agent did not specifically say my move would not be subcontracted, but she implied it. This is an unethical business practice. 2. Despite being told repeatedly that the entire dining room table was marble, the specialty company sent to crate it only had orders to crate the top. Requests for additional manpower were ignored, despite repeated requests for additional men. This item weighs 600+ pounds and requires more than two people to move. They sent two and crated only the top. A second trip by a different company was necessary. AVL billed me for that. 3. Notification of a “non-branded” moving truck was sent during business hours (while people are at work), with the option to choose a branded truck at the cost of a delay in time frame. 4. Fifteen minutes after the above email, a subcontractor was introduced (Traditional Express Van Lines – aka the worst moving company on the planet). 5. The subcontracted mover was over 24 hours late, and repeatedly changed/lied about his arrival time. The subcontracted mover showed up with two movers, and one guy he picked up off the street for the move. I suspect the “extra” guy had no idea how to move things since I had to stop him from applying tape directly to finished wood surfaces. 6. He arrived late in the evening and immediately told me the fee would be approximately $2K higher than the quote due to packing and weight. The few things they packed were packed using boxes, tape and padding supplied by me. I sent the crew away at 1130 pm due to unsafe working conditions (the crew was obviously exhausted). 7. There were no numbered stickers provided, the inventory was done AFTER the truck was packed. 8. Despite repeating that I was in no hurry for the delivery due to having to store my goods, the driver insisted my agreeing to delivery on the 13th. 9. Driver called and indicated he would not deliver unless I paid him the remaining balance. He also indicated that he did not want a cashier’s check, he wanted cash so he could afford to drive the rest of his route. 10. Delivery was actually started on the 17th. Driver showed up hours late with two hoodlums, complete with tattoos and baggy clothes. One was under 21. Driver told me he’d picked them up off the street. Delivery was not complete. Driver agreed to return “first thing” the morning of the 18th. 11. Driver could not locate personnel to assist in unloading the truck and could not arrive until 230 pm. I HAD TO HIRE MY OWN PERSONNEL TO MOVE MY ITEMS since the driver did not have a crew. 12. Despite my instructions not to touch items I had placed on the OTHER SIDE of the storage unit PRIOR to the mover’s arrival (I moved those items myself), many items needed were relocated to the side of the building the mover was to put items in. Many boxes marked “fragile” were on the bottoms of the stacks and the boxes are crushed. I have been unable to inventory for damage at this time. 13. Complaints to the personnel in Florida were pointless. 14. I spoke to Brian who indicated he was the second man on the totem pole. Brian kept telling me I sounded genuine. He also kept telling me he wanted to “make it right”. g.	He offered to waive half the balance due ($1,400) for my trouble as well as “to pay you back for hiring your own movers” This means he offered me approximately 400 bucks for my trouble. After some dickering, I agreed verbally to waive insurance claims in the future, and Brian agreed to waive the entire balance due. No mention was made of my relinquishing my first amendment rights. 15. I was sent a contract to sign saying that I agreed not to write or say anything negative about AVL anywhere. Only after I agreed to that would things be “made right”. I elected to NOT sign their contract. I’ll probably have to sue them later. + PROS: I never have to use them again. - CONS: Incompetent, poorly managed, subcontracted company awful, late, expensive, and tried to get me to waive my first amendment rights to "make it right".